The Calendar Items List appears on the left side of the main window when using the default window layout. If you don't see the Calendar Items List, try clicking the "Calendar Items" option in the View menu. If you still don't see it, then it might be unpinned or hidden. Check along the edge of the main window for a "Calendar Items" label. If you see it, move the cursor over the label to make the Calendar Items List appear. Click the pin button to make it stay in place. If you don't see the Calendar Items list, try resetting the window layout using the Window menu. The Calendar Items area of the main window contains tabs for listing calendars, categories, priority types, and locations. Check boxes next to item names enable associated events, notes, and tasks to be filtered from the display. The checkmarks next to item names are very important. If an item doesn't have a checkmark, its associated events, tasks, or notes will be hidden. If you think VueMinder has suddenly lost your data because the data is no longer displayed, chances are one or more boxes were accidentally unchecked! Click the X button at the bottom of the Calendar Items list to make all items visible. 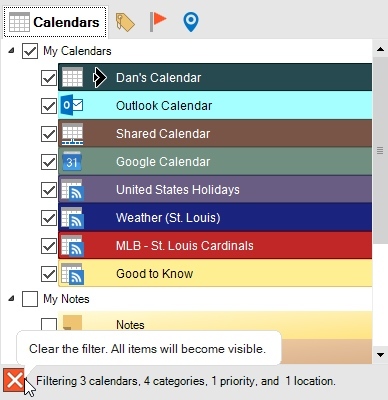 When the "Color Events Using" option in the View menu is set to use the active tab in the Calendar Items area, switching between the tabs will recolor events, tasks, and notes based on the associated calendar, category, priority, and location appearances. The Calendar Items area also enables events, tasks, and notes to be filtered from the display, by unchecking items you don't want to see. Double-click an item in the list to open it. Depending on the type of calendar that is clicked, the Event Calendar Properties, Task Calendar Properties, or Note Calendar Properties will be displayed. When double-clicking a category, priority, or location, the Category Editor, Priority Editor, or Location Editor will be displayed, respectively. The checkboxes can be used to toggle the display of items in the Calendar View, Desktop Calendar, and List View. This enables events, tasks, and notes associated with the unchecked item to be filtered from the display. Any combination of items can be checked or unchecked. The calendar checkboxes can be used to filter the calendars exported to Outlook, Excel, or csv files, when the "Visible Calendars" option is selected in the Export Events window. The appearance settings for the currently selected calendar can be modified from the Appearance Toolbar or the Calendar Properties window. Likewise, appearance settings for the categories, priority types, and locations can also be modified via the Appearance Toolbar, or by opening the appropriate editor from the Tools menu. An example Calendar List containing several calendars is shown below. As you can see, the calendar appearance settings are also applied to the calendar names to help visually distinguish which events belong to which calendar. Calendars can also be arranged within different calendar groups. The active calendar will show a black selection indicator. This will be the default calendar when creating new events unless a different default calendar has been locked in. An event calendar that is not synced with any external calendar. An event calendar that is published. An event calendar is a subscription. An event calendar that is both published and a subscription. An event calendar that is shared over a local network. An event calendar that is synced with Exchange Server. 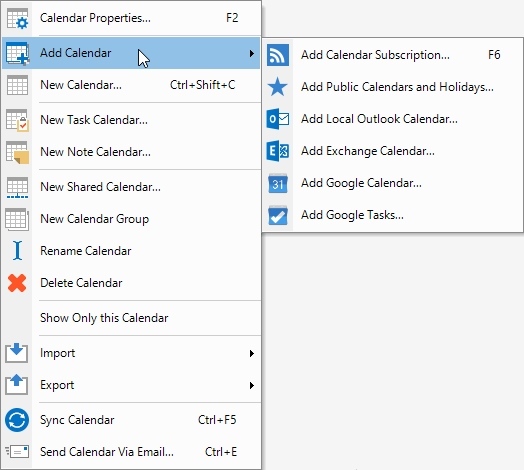 An event calendar that is synced with Outlook. An event calendar that is synced with Google Calendar. A task calendar that is not synced with any external calendar. 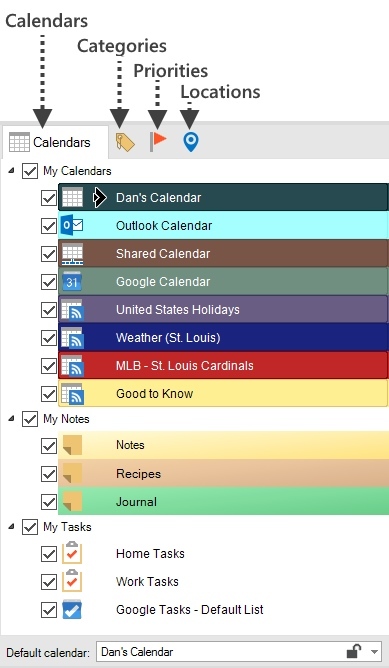 A task calendar that is synced with a Google Task List. A task calendar that is shared over a local network. A note calendar that is not synced with any external calendar. A note calendar that is shared over a local network. When a calendar is activated, it will be the default calendar for any new events, tasks, or notes. Depending on the active calendar type, double-clicking an empty area in the Calendar View will result in either a new event, task, or note being created. For example, if the "Notes" calendar is active, double-clicking an empty area in the Month view will result in a new note being created. Before creating a new item, you can activate the desired calendar to avoid needing to select the calendar from the Calendar drop-down in the editor window. When an item is clicked in the Calendar View, the calendar associated with the clicked item will be activated. In addition, the VueMinder application's title bar will be updated to indicate the name of the currently active calendar, and the Status Bar will refresh to show the active calendar's details. On each of the tabs of the Calendar Items area, checkboxes are displayed for the various items. These checkboxes are used for filtering display of associated events, tasks, and notes from the Calendar View. For example, if you have a calendar containing events that you usually don't need to see, you can uncheck the calendar in the list. Similarly, if there is a certain category, event location, or priority type that you don't need to see, those can be filtered as well. When items are filtered, a message will be displayed at the bottom of the Calendar Items area. This message contains an "X" button, enabling the filter to be reset, so all events, tasks, and notes will be displayed. Any tab having one or more active filters will have its name in bold. In the example above, every tab has at least one filtered item. This will open the Calendar Properties window for the currently active event calendar, where the calendar's appearance, event defaults, and sync settings can be viewed or modified. If the active calendar is a task calendar, the Task Calendar Properties window will be displayed. Likewise, if the active calendar is a note calendar, the Note Calendar Properties window will be displayed. The keyboard shortcut for accessing the Calendar Properties is F2. This will initiate a new calendar subscription. The Sync tab of the Calendar Properties window will then be displayed, enabling the location of the calendar to be specified, along with other subscription settings. The keyboard shortcut for adding a calendar subscription is F6. After selecting this command, the Add Public Calendar window will be displayed, enabling you to browse a list of publicly available calendars and select ones that you would like to add to your calendar list. These public calendars cover things like holidays for a variety of countries and religions, sports and entertainment events, science and astronomy events, and much more. This command will import an existing calendar from Outlook and configure it to automatically sync with VueMinder. The calendar must be located in a local Outlook .pst file. If your Outlook calendars aren't listed and if you sync Outlook with Exchange Server, use the "Add Exchange Calendar" command instead. This is equivalent to using the Import Events window to import from Outlook and the Sync tab on the Calendar Properties window to enable syncing with Outlook. This command will connect to Exchange Server and show a list of calendars that are available on the server for syncing with VueMinder..
VueMinder requires Exchange Server 2010 or later. Syncing won't work with earlier versions of Exchange Server. The Exchange Server can be on your local domain or hosted, such as Exchange Online (Office 365). This command enables you to add an existing Google Calendar to your calendar list. Selecting this command will result in the Add Google Calendar window appearing, where you can select from the calendars seen in Google Calendar and add those to VueMinder. When adding a Google Calendar, you can choose from several sync methods, including 1-way and 2-way. This command enables you to to add an existing Google Task List to your calendar list. Selecting this command will result in the Add Google Tasks window appearing, where you can select from the task lists seen in Google Calendar and add those to VueMinder. After selecting this option, a new event calendar entry will be added to the Calendar List. The Calendar Properties window will appear, enabling the calendar name and settings to be specified. The new calendar will become the default calendar when creating new events. You can change the default calendar by clicking on a different calendar in the list or by selecting a calendar in the "Default Calendar" drop-down list located below the Calendar List. The appearance of events belonging to the calendar can be modified by using the Appearance Toolbar or Calendar Properties command. The keyboard shortcut is Ctrl+Shift+C. After selecting this option, a new task calendar entry will be added to the Calendar List. The Task Calendar Properties window will appear, enabling the calendar name and settings to be specified. The new calendar will become the default calendar when creating new tasks. You can change the default calendar by clicking on a different calendar in the list or by selecting a calendar in the "Default Calendar" drop-down list located below the Calendar List. After selecting this option, a new note calendar entry will be added to the Calendar List. 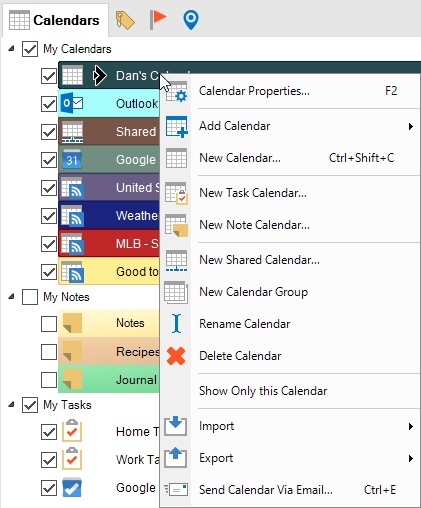 The Note Calendar Properties window will appear, enabling the calendar name and settings to be specified. The default appearance of notes belonging to the calendar can be modified by using the Appearance Toolbar. The new calendar will become the default calendar when creating new notes. You can change the default calendar by clicking on a different calendar in the list or by selecting a calendar in the "Default Calendar" drop-down list located below the Calendar List. This command is similar to the "New Calendar" command, except the created calendar will default to being shared over the local network. The user permissions for the shared calendar can be adjusted on the Sync tab of the Calendar Properties window, which will be automatically displayed after selecting this command. This command will create a new top-level calendar group. Calendar groups can be used to logically group similar calendars. For example, if you have several calendar subscriptions, you could create a new calendar group named "Subscriptions" to contain these. 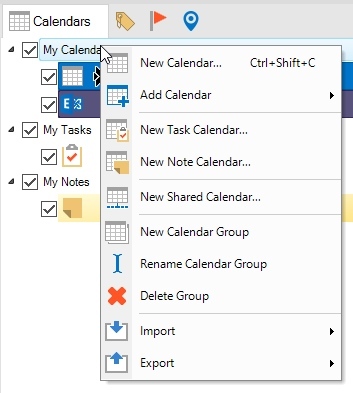 After creating a new group, existing calendars can be dragged and dropped into the new group. This command will enable the calendar to be renamed. Any calendar can be renamed, to anything you want. 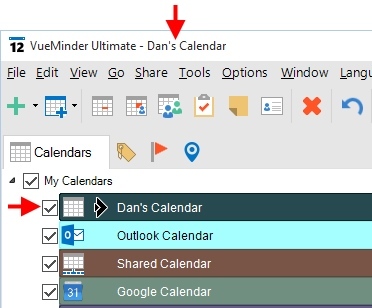 However, if the calendar syncs with Outlook, be aware the calendar names must be the same in both Outlook and VueMinder in order to properly sync. This command will delete the active or selected calendar. Before the calendar is deleted, you will be prompted to confirm the deletion. The keyboard shortcut for deleting a calendar is the Delete key. This command will filter all items except those associated with the currently selected calendar. To restore the display of all calendars, click the X button below the calendar list or click the "Show All Events" command on the View menu. This command expands into a submenu containing the following commands: Import Events, Import Tasks, Import Notes, and Import Contacts. Data can be imported from a variety of sources, including iCalendar/vCalendar files, comma- or tab-delimited text files, Excel spreadsheets, Outlook, Google Mail, and more. This command expands into a submenu containing the following commands: Export Events, Export Tasks, Export Notes, and Export Contacts. This command is visible only when a calendar is selected in the Calendar List that can be synced. It will sync the selected calendar. For calendars that are published, the latest changes will be updated to the publishing location. For calendars that are subscribed, the calendar will be updated from the subscription location. Any local modifications will be overwritten unless the calendar is also published. This command will synchronize calendars that are shared with Microsoft Outlook, Exchange Server, Google Calendar, or the local network. During the Sync operation, the status bar will update to show the current status. After the Sync operation completes, the status bar will indicate "Ready". The keyboard shortcut for syncing the current calendar is Ctrl+F5. To sync all calendars, press F5. This command will save the currently selected calendar as an iCalendar (.ics) file and attach it to a new email using your default email program. If you don't have an email program installed or configured on your computer, this command won't do anything. The keyboard shortcut to send a calendar or event via email is Ctrl+E. Right-clicking a top-level calendar group will result in the following menu. Most of the commands are the same as the ones described above, when right-clicking a calendar name. However, a few are different, and will be described below. This command enables the calendar group to be renamed. Calendar groups can have any name, as long as the name is unique and not used for any other calendar groups. This command will delete the calendar group and all calendars it contains. Use with caution! When right-clicking a category, priority, or location, a context menu similar to the one shown below will be displayed. In the example below, a category was clicked. Similar commands will be displayed for priority types and locations. This command will create a new category, priority type, or location, and then display the new type in the appropriate editor window, where its appearance can be optionally modified. After adding a new type, the displayed list will be refreshed. This command will delete the selected category, priority type, or location. Any events, notes, tasks, or contacts associated with the deleted item will be automatically updated to remove the association. This command will cause the selected item to be visible. In other words, if it was previously filtered, it will no longer be filtered after selecting this command. This is equivalent to checking an item's box. This command will cause only the selected item to be visible. All other items will be filtered. This is equivalent to unchecking all boxes except the selected item. This command will cause the selected item to be filtered. In other words, any events or tasks associated with the selected item will not be displayed in the Calendar View. This is equivalent to unchecking an item's box. These commands will check or uncheck all items. To restore visibility of all items, click the "Show All" command. 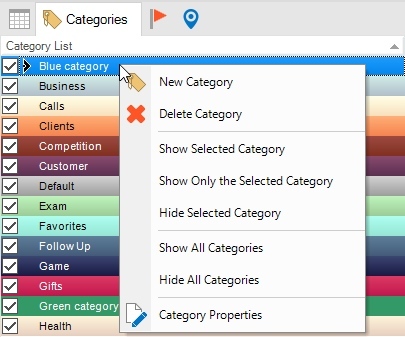 When a category, priority, or location is right-clicked, the Category Editor, Priority Editor, or Location Editor will be displayed, respectively. Selecting this command is equivalent to double-clicking an item.